Meals at Judson Park are an event, nourishment for the body and the spirit. Whether you dine in our beautiful restaurant or casual bistro, you’re in for a treat. We use the freshest ingredients, sourced locally when possible. Our menus change regularly, but if whatever you’re craving isn’t on the menu, don’t worry—we can whip something up. And we’re happy to accommodate special diets, including vegetarian, vegan and gluten-free. With our flexible MyChoice dining program, you choose when, where and what you eat. No minimum orders, no deadlines, no points lost. Chef Monica has been with Judson Park since March 2017. 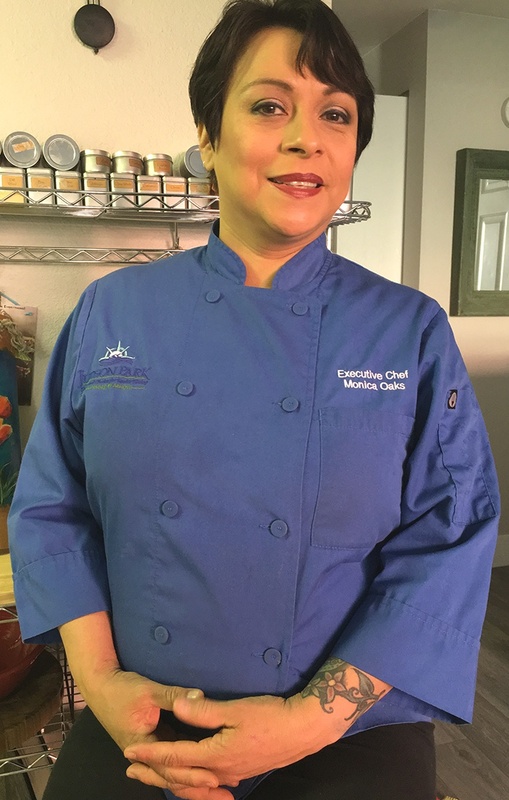 She worked previously as an executive chef at Western Washington University and Warm Beach Retirement Community, and as an instructor in the culinary arts. She holds a certificate in advertising and culinary arts. Q: What do you enjoy most about working at Judson Park? A: I enjoy seeing the reaction from the residents when they eat something that has a fond memory attached to it. A: My approach to cooking is no-nonsense, rustic flavors and a home-style feel. A: I love our macaroni and cheese. A: I cook home-style comfort food for my family and friends. A: Peel ginger with a spoon and a touch of star anise in chicken broth gives it a “can’t put your finger on it” amazing flavor. Five minutes is all it needs. See how delicious life at Judson Park can be. Call (800) 401-4113 to schedule lunch.